Sometimes, you can look at something, and see a story. That is certainly the case with this spigot on a bathtub tap. As you can see, it is an interesting design. 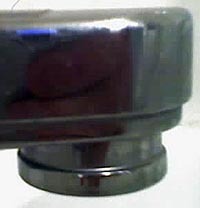 There is a “lip” on the business end of the spigot (you can see it in the second photo.) This has a shape that affords pulling. 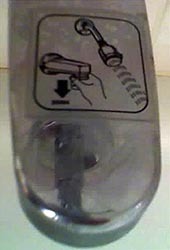 The user is supposed to pull this down to enable the shower head. It is clever. It probably has very few moving parts, and costs very little to manufacture. 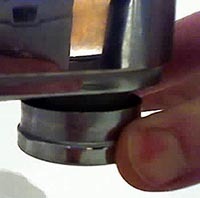 Pulling down on the spigot probably moves a baffle into place that blocks water flow through the tap, and forces the water to go up to the shower head. Too bad they probably blew all their profit on damage control. Customer service is a very real, and often overlooked cost. Good designs require less customer support. Companies need to quantify the cost of support, and then factor that into their design priorities. In this case, they probably saved fifty cents per spigot, and spent a dollar per call. Not everyone who brought one of these would call, but most customers would chalk up the manufacturer as less-than-desireable, and would probably not get any products from that company again. They may also complain to the plumber that installed the system. The plumber might be a bulk customer of the taps, and the company may lose a thousand units as a result. This is a common problem when designers live in their own world. In the world of bathroom plumbing fixture designers, this was probably an elegant and intuitive solution. I’ll bet that one of the biggest issues with bathroom fixtures is all the various knobs and gizmos. There is always a concerted effort to design “one turn” taps and fixtures. These have varying degrees of success. I have gotten into hotel showers that have frozen me half to death because I couldn’t figure out how to make the water hot, and I have used taps in sinks that force you to drip water all over the countertop because of their placement. There is no real solution for this without a complete redesign, which is certainly why that sticker is on the spigot. I shop at a supermarket that has the new electronic cashiers. I’m actually fairly bemused at their efforts. At least 30% of the times I’ve used it, the darn thing has had to be babysat by a human cashier. However, even when it does work, it has a really awkward design that I consider absolutely unforgivable. The unit on the right is the main touchscreen panel. You use this for all your interaction. The unit on the left is a small, standard-issue supermarket card reader with a swipe and a small touchscreen. It is identical to the ones they use at the normal cash registers. The problem is pretty basic: You use the big color screen for almost everything, until it comes time to pay. Fair enough. Use the card reader for swiping the debit card and entering the code. It’s slightly more secure that way, and it probably requires simpler (i.e. less buggy and more secure) code to turn it over to the small keypad. However, the system doesn’t delegate the entire payment process to the card reader. You start with the display you see in the photo. Remember that you have been using the big color monitor for the last five minutes to scan all your groceries. You are standing in front of it and getting all your queues from that display. When it comes time to pay, the big display asks you for a payment method. I usually use a debit, so I click on the “Debit” button. I am then presented with the display that you see in the photo, where it says to use the keypad. At this point, I experience a slight “face plant” (face plant number one). This is where I go “huh?” and look for the keypad. Note that the big display refers to it as a “PIN Pad.” This is face plant number two. Different manufacturers and stores use different equipment. Most of the modern ones have the card swipe and keypad in the same unit, but older ones would have separate units. It’s quite possible that the instructions would be in a display separate from the PIN entry keypad. I think the terminology is awkward. They should display a photo or drawing of the unit. Now, I’m pretty sure that these cashier systems were designed to mesh with a number of different keypad systems, and that is one of the reasons for the awkward terminology. Nevertheless, there has got to be a gigantic amount of work in installing and customizing each unit. Part of that customization should be the selection of a module that displays the appropriate image. 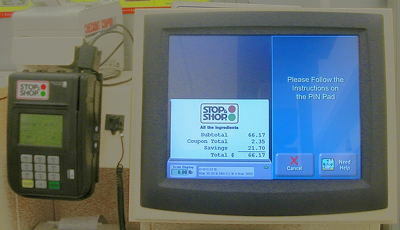 What I don’t know, is that now the large display is displaying a cash back prompt, and showing a number of buttons. I’m standing in front of the PIN Pad, like a idiot, waiting for the display to change. This is completely different from the standard routine at a normal cashier. In those cases, the little display has the same message, but the cashier then asks you for the cash back amount. Your attention never leaves the display. Remember that all my attention is now on the little display. This is a very bad face plant (face plant number three). I have used the same system many times over, and yet I constantly go through the same thing. I am no dummy. Some other customer may have the routine down pat, but I don’t. The control flow is suddenly shifted away from the small keypad. Have the main display ask for the cash back amount before turning you over to the PIN Pad. When I first laid eyes upon this baby in a Radio Shack store, it was love. I thought that I had found the perfect amalgam of technology and usability. Now that I have had a chance to [mis]use the thing for a while, I think differently. 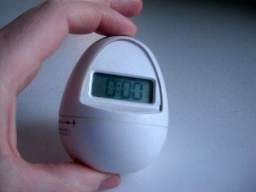 It’s an egg-shaped kitchen timer. It’s precise to the second. It counts up. It counts down, and you set it by turning the base. Much like my old-fashioned analog tomato timer. The really kewl thing about it is that it’s digital, and digital, as all us geeks know, is better. So why did I give it away, and why do I continue to use my old analog tomato timer? Because the damn thing is difficult to use. The neat, turn-the-base setting function is non-intuitive, the display is remarkably hard to read from a distance, and the very precision that first attracted me now gets in the way. Let me explain. The way you set the time is to turn the base, while holding the top. If you turn the base slowly, the time increments/decrements by ten seconds. If you turn it faster, the time changes by minutes. The actual position of the base doesn’t mean anything. It is the act of turning it that sets the time. To start the countdown, you set it to a time, and hit the silver button on the top. To count up, you leave the unit at zero, and hit the button. 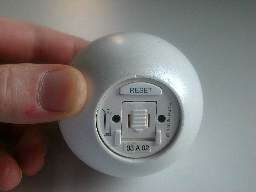 When the countdown is over, the egg beeps continuously until you press the button. On the bottom of the unit is a “Reset to zero” button. More on that in a bit. It is very simple: zero to sixty in one turn. You turn it to the desired number, and put it down. When it is done, it dings a bell for about a second. If you want to time less than fifteen minutes, you need to turn it past fifteen minutes, then turn it back. This “primes” the bell. If you don’t do this, the bell won’t ring as loudly. They have increased the number of visible tick marks between zero and fifteen minutes, to one tick per minute, as they figure you’ll need a bit more precision. Above fifteen minutes, they just give one tick mark every five minutes. 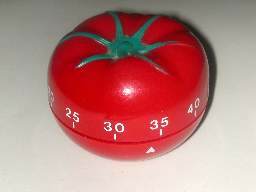 It takes me two seconds, and one turn of the wrist to set the tomato to 33 minutes. It can easily take me ten seconds to set the egg to 33 minutes. On the other hand, with the egg, you have to make several complete turns. There is a non-inuitive threshold at which the turning of the base causes the time to increment by a minute, as opposed to ten seconds. I used the egg a lot, and I never really figured out exactly how fast you needed to turn it. This often meant that I had to turn the thing twenty full rotations before reaching my time. When I would get close to it, I’d slow down, and then slowly turn the dial until I reached my desired time. This resulted in a long, drawn-out process. Okay, in review: One quick twist, compared to twenty-five turns of a dial and ten seconds or more. Which would you prefer? I gave away the egg. The egg has one more fatal flaw. On the bottom, there is a reset button. 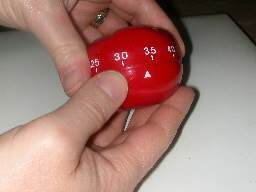 Pressing this when the timer is stopped, will reset the time to 00:00. However, if the timer is going, holding the reset button will prevent the silver Stop/Start button from operating. It will also prevent it from operating if the timer is off, so the timer will not start when the Reset button is pressed. The “simple” rotating dial actually doesn’t work the way you’d expect. You need to “wake up” a bit, and spend higher-level brain function on keeping track of the displayed time. The blasted thing won’t stop/start. 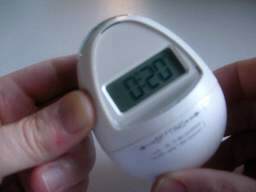 This is because the natural way to hold the egg timer is one finger on top, and your thumb on the bottom. This causes both the reset and the start/stop button to be pressed simultaneously, resulting in…nothing. I have watched smart people staring at the timer for over a minute, trying to figure out why it doesn’t work. The problem here is that the designers tried to adapt a function to a form. BAD IDEA. 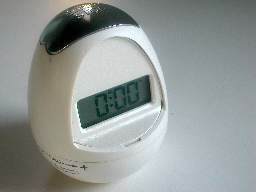 This is a digital timer, and it needs a digital interface. They should have developed a form that matched the functionality. I got this great Sony Vaio sub-notebook computer. It is a really kewl little computer, and actually fits into my folder case. It is designed for the “wireless on-the-go executive.” However, there is one problem. 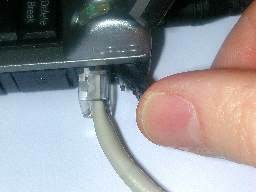 When they designed the socket for a physical (wired) Ethernet connection, they made a decision that directly affects the usability of the computer. If you have very big fingers, then it will be impossible to remove the cable with your fingers. You’ll need a tool. I guarantee that many people just rip the cover off. The others just never plug in a cable. I need to plug cables in fairly frequently, as the wired network is a LOT faster than the wireless network. I’m pretty sure I know why they designed it this way. It probably has to do with getting at the plug while the modem port (located right next to it) is open. If you have a plug in each, then it is very awkward indeed to get at them. However, the modem port is designed to be far more accessible than the Ethernet port. This is an understandable decision. They probably decided that, since this was a travel computer, people would be plugging modems in much more frequently than they would Ethernet cables. I travel a lot, and just about every hotel in which I stay, I use an Ethernet-based connection for high-speed Internet. In some cases, I get a wireless connection. In only a very small number of cases do I have to use the modem port, so any design that favors the modem port is, in my case, a bad design. Now, Sony is a company that is known for good user design (funny that my first two posts are on Sony products, though. ), so I am sure that this was carefully thought through. Far be it for me to second-guess them; but I will anyway. Turn the Ethernet plug around. I’m pretty sure that the reason they didn’t do this already is because there is a real danger of giving youself the “bamboo-splint-under-the-fingernail” treament if there is a wire in each connector. Maybe the risks of being sued outweigh the usability gains. I dunno. 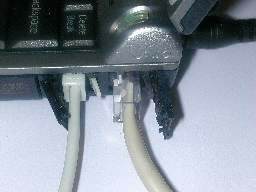 No matter which direction the Ethernet plug faces, the modem port cover is very difficult to open when there is a plug in the Ethernet port. I have to remove the Ethernet cable in order to open the modem port. Exchange the positions of the Modem and Ethernet plugs. This is merely a reallocation of the priorities. In my case (and, I’ll bet, in a lot of other peoples’ cases), the Ethernet cable is more important than the modem cable. I just got a new Sony DVD/VCR combo. It allowed me to remove two pieces of hardware (a VCR and a DVD player). I wanted a combo box, so that either a DVD or a video could be played eaqually easily. This is especially important nowadays, as video rental stores are starting to heavily favor DVDs. I needed the ability to get all of the regular features of a VCR, such as tape recording and cable TV tuning. I could care less about recording DVDs. I like Sony. They have good quality, so I selected a VCR that fit my needs, at a reasonable price ($150 US), Despite having the features I need, it has a remote control that is akin to a space shuttle cockpit. I would have preferred a simpler remote. They finally allow a recording to start when the VCR is still on! I have never been able to justify the fact that VCRs don’t execute a programmed recording unless the VCR is off at the time the program begins. I understand why they do it, from a technical and customer service point of view, but it has resulted in my not recording shows that I really wanted on tape. Sometimes I had accidentally left the VCR on (I’ll get to that in a minute), and sometimes I was watching something else at the time the recording was supposed to start. In software development terms, this is a “data loss” situation. That means that something is lost through the error or planned behavior. In this case, what is lost is the show that I wanted to record, and that I spent so much time setting up. I would have much rather had the VCR suddenly switch away from the program I was watching, than I would have it miss the program I set. I was overjoyed to see this VCR do exactly that. Yeah, it’s a bit disconcerting, but worth it. This was an unexpected bonus. I had no idea that the VCR did this, as Sony chose not to make a big deal out of it. This VCR makes the same mistake as the last couple of VCRs I’ve owned: They don’t let you use the number keys to change channels while programming the VCR. You must use the up/down buttons. This means, that if you are at Channel 80 when you start programming, the default channel is set to the one you are watching (80). very nice, but you want to record a show on Channel 2. No, you can’t enter “2” via the numbers. Nor can you enter “02,” or even “002.” No, you need to go up to the up/down buttons, and click on “Down” until your thumb falls off. In today’s world of 500-channel digital TV lineups, that is BAD. The solution that most people would probably hit upon is to get out of Program Mode, use the numbers to select the channel, then go back into Program Mode. In my opinion, any consumer device that requires its users to develop any kind of workaround for one of its main core functions (remember what I considered a “Must Have” for purchasing the device in the first place), is an illustration of the poor emphasis on usability in today’s products. This VCR is no different from others I’ve owned, in that it is very difficult to tell, from across the room, whether or not it is on. The display is faint, and displays the time in either case. The only difference is a couple of icons that show up around the time, and the display is slightly brighter when it is on. I tend to turn the TV off, and leave the VCR on. In my previous VCR, this was a big problem, because it meant that programs I had entered would not be recorded. This VCR avoids that issue by starting a recording whether or not the VCR is on (yay!) However, if you are an energy-conscious person, or want to watch the TV by itself (the VCR causes interference when it is on, even when the TV is directly accessing the antenna), then you may be annoyed. True, these are merely small annoyances. It is a matter of squinting across the room at the little display, seeing a couple of extra characters, grunting “Darn!” and turning the VCR off. However, these small annoyances are cumulative. Each one is a strike against the product. The sad rule is that people tend not to notice it when you make their lives easier, but really notice it when you do something that annoys them. I doubt very much that any other bloggers are dancing around celebrating the fact that the VCR starts recording at any time, but they will go to great lengths to complain about the annoyances. Big difference, huh? I deliberately made the pictures small, blurry and badly lit, just like my living room at night, when I’m watching TV. The buttons that you would naturally believe should work (the number buttons) don’t work. Okay, you’ve had your routine interrupted by the number buttons not letting you change the channels. You have to cycle through all the channels with the up/down buttons. I hate it when people complain without suggesting solutions. Here are my thoughts on how I would improve the product. One thing that you have to take into consideration when designing consumer products, is that small things can make a big difference in price. Margins on these devices are incredibly thin. Extra testing and adding extra components (even very cheap ones) can make a big difference. For this reason, these solutions might not work. 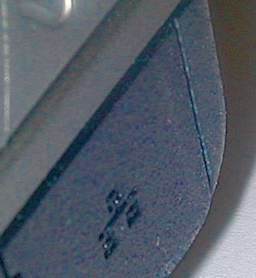 Allow the numeric keys to be used in selecting a channel while programming the VCR. The costs incurred here would be extra testing. The software inside the unit would probably be fairly easily modified to support this. However, it would open up a whole bunch of new “trouble nodes” for testing. Add a clearly visible light somewhere on the unit to indicate an “On” status. The extra cost here would be the component (an LED), the extra step in the construction process to add it, and the test step.